As I mentioned a week or two ago, in January, EgmontUSA announced that they were going out of business, and that this spring’s list would be their last. I signed up to participate in Cuddlebuggery’s Last List Blog Hop in hopes of offering at least one of the affected writers a little bit of free publicity. This review is part of that blog hop. 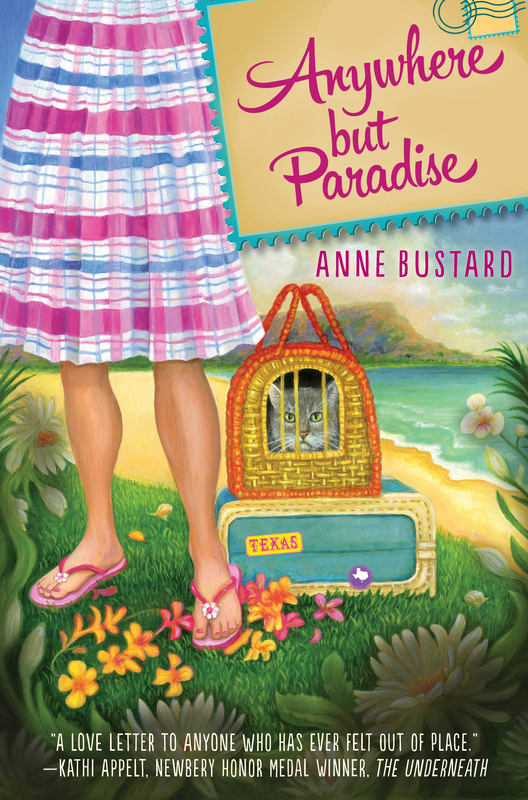 Anywhere but Paradise is a beautifully written middle grade (MG) novel about Peggy Sue Bennett, a 12-year-girl who moves from Gladiola, Texas to Hawaii after her father gets a job in the sugar cane industry. Aimed at readers ages 8-12, Anywhere but Paradise touches on several important, yet difficult issues, for YA readers: bullying, discrimination, loneliness, and coming to terms with major life changes over which you have absolutely no control. Some of the writing may be too intense for younger or emotionally tender readers — I had a lump in my throat from almost the opening pages. The scene where Peggy Sue has to leave her beloved cat, Howdy, in the quarantine center is heart-wrenching. Throughout the novel, Bustard uses Howdy’s situation extremely effectively to mirror the struggles Peggy herself is going through. The parallels are skillful, adding pressure to Peggy’s situation without being purely duplicative. There is another tough section toward the end of the book, when a tsunami strikes Hawaii and Peggy Sue is separated from her parents. The days of uncertainty while Peggy Sue waits to hear whether her parents have survived are a bit harrowing. Still, even in the darkest moments of the novel, I never lost hope for Peggy Sue. In fact, I found the ending both deeply satisfying and realistic. Things will never be perfect in Hawaii, but Peggy Sue manages to make a place for herself within this new and gloriously imperfect paradise. Anywhere but Paradise is a marvelous book, and I look forward to reading more from Bustard in the future. Disclosure: I received a free kindle copy of Anywhere but Paradise from EgmontUSA via NetGalley in exchange for a fair review. You can preorder Anywhere but Paradise from Amazon here. The book will be available in stores March 31, 2015.